Funeral services will be held on Thursday, April 5, 2018, at 1:30 p.m. at Trinity Lutheran Church in Odessa. Rev. Thaine Kister will officiate and burial will be in Trinity Lutheran Cemetery. Visitation will be held in the Chapel of Madison Lutheran Home on Wednesday from 5 – 7 p.m. A prayer service will be held at 7 p.m. Visitation will continue at the church on Thursday, one hour prior to the service. Casket bearers will be: Scott Maas, Steven Maas, Jerrie Lund, Brian Bremseth, Bruce Bremseth, and Keith Johnson. Honorary bearers will be members of Bellingham American Legion, and the staff and residents at Madison Lutheran Home. James Galen “Gay” Lund was born on September 14, 1927, on a farm in Hantho Township, Lac Qui Parle County, MN. He was the son of Alvin and Thora (Nelson) Lund. He was baptized and confirmed at Minnesota Valley Church. James graduated from Appleton High School with the Class of 1946. James entered military duty on January 16, 1951, in Madison, MN. He was honorably discharged on May 21, 1952, at Camp Rucker, Alabama. James attained the rank of Sergeant. He was a military vehicle truck driver and an instructor on the 105 Howitzer heavy guns for new recruits at Camp Rucker. James was united in marriage with Yvonne Johnson on January 30, 1954. 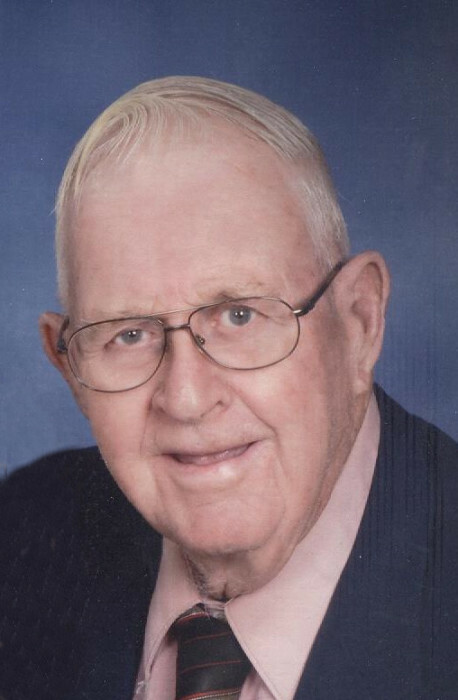 He was a member of Trinity Lutheran Church in Odessa where he served as an usher and secretary of the church council for many years. James was the claims adjuster for 18 years and secretary of the board of directors for Agassiz Insurance in Odessa. He was a member of the American Legion in Bellingham, MN. James served 20 years on the Big Stone County Board of Adjustment. He served on the Odessa City Council and was a member of the Odessa Fire Department. James enjoyed farming and playing cards. He was a fan of the Minnesota Twins and Vikings. On April 17, 2017, James moved to Madison Care Center. He passed away at St. Cloud Hospital on March 30, 2018, at the age of 90 years, 6 months, 16 days. Left to cherish his memory are his wife of 64 years, Yvonne; son, Richard Lund; brother, Harlan (Erma) Lund of Rolfe, IA; Donald (Yvette) Lund of Tehachapi, CA; sisters: Arlene (Carl) Maas of Odessa, MN; Gladys Uphoff of Cloquet, MN; sisters-in-law: Evelyn Lund of Alexandria, MN; Joan Bremseth of Madison, MN; brother-in-law, Art Shelstad of Odessa, MN; and many nieces and nephews. He was preceded in death by his parents; son, Michael; two brothers: Allen Lund and Charles Lund; and nephews: Mark Maas and Troy Snow.